Recently, I was a participant in the 26th Annual Bataan Memorial Death March – an experience that was both meaningful and memorable. 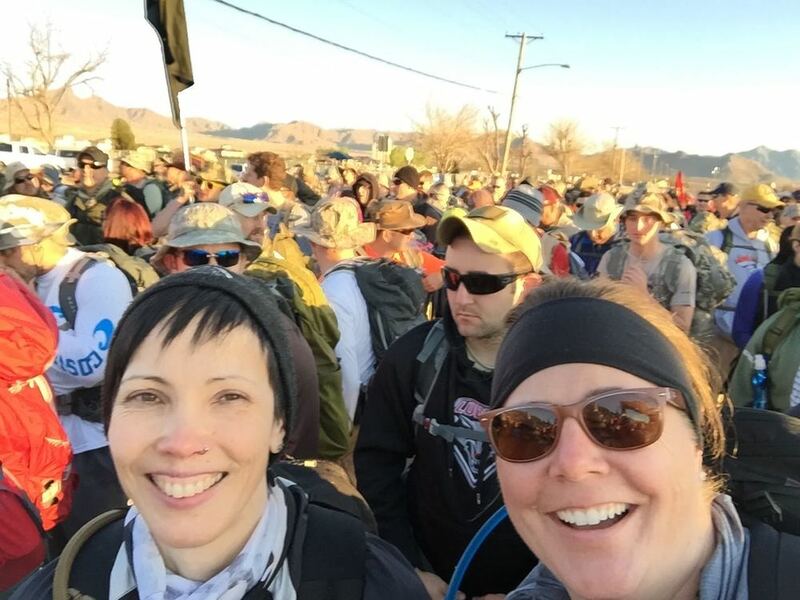 This event, a 26.2 mile walk through the New Mexico desert terrain of the White Sands Missile Range, honors the American and Filipino soldiers who defended the Philippines during World War II. In January 1942, Japanese Imperial forces invaded Luzon (the largest island of the Philippines), whose Bataan Peninsula and Corregidor Island were now the only obstacles to Japanese control of Southeast Asia. The Americans and Filipinos held the Japanese off for three months despite a severe shortage of rations and equipment, but on April 9, 1942, they were forced to surrender and were taken prisoner. 76,000 American (Army, Army Air Corps, Navy and Marines) and Filipino (Philippine Army and Philippine Scouts) troops were forced to march through the Phillipine jungle, from the town of Mariveles, Bataan where they had made their last stand, to San Fernando, Pampanga. Those who arrived at San Fernando were crammed into boxcars--where heat and lack of ventilation took a further toll--and those who survived the rail trip to Capas, Tarlac were then forced to walk the last nine miles to Camp O'Donnell. The POWs endured brutal treatment at the hands of their Japanese captors: stripped of their weapons and possessions, they were given very little food or water, and savagely mistreated. Thousands died along the way, from dehydration and exhaustion in the sweltering heat of the Philippine jungle, or from being beaten and bayoneted when they were unable to keep marching. And for those who survived the march, the misery was far from over. At Camp O'Donnell, overcrowding, poor sanitation and lack of medical care led to many more deaths from malaria, dysentery and other diseases. Up to hundreds per day were buried in mass graves. Prisoners were subjected to forced labor, both in the Philippines and in Japan after enduring a nightmarish transport on "hell ships" which were sometimes unwittingly sunk by U.S. forces. The suffering of these POWs did not end until August 1945 when the Japanese surrendered. An Allied military commission later determined the march to be a Japanese war crime. As the general in charge, General Masaharu Homma was tried and indicted for permitting his troops to commit crimes against humanity, and was executed by firing squad in Manila in 1946. The state of New Mexico bore a heavy burden from the Bataan Death March. 1,800 members of the 200th Coast Artillery, New Mexico National Guard, were deployed to the Philippines in WWII, and only half of them survived. Thus the Bataan Memorial Death March began in New Mexico in 1989, sponsored by the Army ROTC at New Mexico State University. In 1992 White Sands Missile Range and the New Mexico National Guard also became sponsors and the memorial march was moved to White Sands. The march has grown from 100 participants to around 6,500. Most marchers come from the military but many civilians also participate--including yours truly. Me and Sue awaiting the opening ceremony. The big flag marks the starting line. As a ten year old Girl Scout in the Philippines (where my father was posted to the American Embassy in Manila), I took part in a commemorative reenactment of the Bataan Death March. To be allowed to participate, we kids had to complete 30 miles of "pre-hikes", as well as learn about the history and write a report. I read Hour of Redemption by Forrest Bryant Johnson, which described the brutality of the march, the imprisonment of some survivors at Cabanatuan POW camp, and their rescue by U.S. Army Rangers in January 1945. Our memorial march covered 35 miles over 4 days. For the first 3 nights we camped in tents at Sun Moon Beach, and our last day of hiking brought us to the top of Mount Samat. There we spent the night at the Mount Samat National Shrine with its 300-foot memorial cross, dedicated to the Filipino and American fallen during WWII. On a separate occasion, we also visited Corregidor Island where we saw the ruins, underground tunnels and fortifications of what had been Allied headquarters and temporary seat of the Philippine government in WWII. These were some of the formative experiences of my childhood, so (36 years later) when I learned about the New Mexico memorial march (from some members of my Crossfit gym who were going), I knew I wanted to do it. I only found out about three weeks before the 2014 event, so I planned to do the next one in 2015. I wanted to do the "heavy" (weighted) category, so I started preparing (around the end of November 2014) by doing lots of rucking (walking/hiking with a weighted pack)--as well as weights, running & rowing, and Crossfit-style workouts--but mainly rucking. As I started doing longer and longer rucks, it became more time-consuming but it also gave me time to listen to audio books. A lot of people had recommended the book Tears in the Darkness by Michael and Elizabeth Norman, so I listened to that--and there was no better motivation to keep me slogging away at those miles than to listen to the harrowing story of American POW, Bataan survivor and artist Ben Steele, and to reflect on how easy I really did have it. I also managed to rope in a friend and coworker, Sue, who had no previous experience with rucking but is an experienced marathon runner. We trained outdoors throughout the long Chicago winter, which although it wouldn't directly help us with the New Mexico desert, certainly helped us with mental focus and confidence. White Sands Missile Range is about an hour's drive from El Paso, basically out in the middle of the desert. On the morning of the march, we arrived at about 4:30am while it was still dark with temperatures in the 40s. An enormous American flag waved, suspended from a crane, against the dark backdrop of the mountains, as we joined the crowd of 6,500 people, mostly wearing camouflage, all waiting for the opening ceremony to begin. The ceremony included the posting of colors and "Reveille", the National Anthem, a welcome address by the commanding General of White Sands, a speech by the Philippine Ambassador, and a very moving symbolic roll call of the Bataan survivors--first the names of those who are still living, then those who had died since the previous year. I'm not much of a cry-er, but that roll call got to me. It really did. Finally it was time for everybody to move to the starting point (where the big flag was). We expected to be marching shortly, but then we kept moving very slowly for something like an hour. Everybody was wondering why--and then we finally saw that people were lining up to shake hands with three men: three Bataan survivors. I can't adequately describe this moment; I'm pretty sure I babbled something nonsensical as I shook hands with each of these old, fragile men--thinking that I must be careful not to break them, and yet knowing that each of them had survived hell, and were a hundred times tougher than I'd ever be. So, the march is 26.2 miles through the rugged New Mexico desert. The weather was beautiful--clear blue skies, a cool breeze, and strong sun which would get hotter throughout the day. The elevation ranges from 4,100 to 5,300 feet and it's very dry--quite different from the Philippines. The route goes over sand, dirt and rock, with one stretch of paved road, and a soft "sand trap" area. It circles a small mountain, uphill and downhill, and then retraces its path to the start. The scenery consisting of mountains, sand and rocks, cactus and sagebrush, was a wonderful sight after looking at nothing but gray skies and piles of snow for months. Sounds lovely, right? I'm really glad that Sue was marching with me, since she had done numerous marathons and I'd never done anything this long. True, I've done a couple of Gorucks, but although those events last 12 hours, they seem like an entirely different beast. This was just one long slog. Very long. I didn't have any concept yet of what "mile 20" might feel like--it was abstract for me. Another important thing--when we came to the first water stop, I took a cup of water and drank it--then I saw Sue drink like, two waters and two Gatorades. Yep, that was an important thing to learn: drink all the waters, all the Gatorades, and eat all the orange and banana slices at each stop. We also carried water mixed with Nuun electrolytes, and snacks such as mini Payday candy bars (which were great). I think if there's one item I would bring next time, it would be potato chips, because they're salty. Actually make that two items: the pack I was using did not have a hip belt, which resulted in shoulder fatigue. Above: approaching the mountain. Beyond that bridge, there were 5 miles of uphill. Note Philippine flags. Right: I think this was part of the "downhill" section, after mile 14. Other than how hard this event is, the most noticeable thing was how awesome the people were. There was such a positive spirit among the marchers; people weren't merely happy to be there, they were proud and honored. Marchers carried American and Philippine flags, and wore their reasons for marching on their backpacks, or on their bodies: remembrance ribbons with buddies' or relatives' names, t-shirts with survivor's photographs, patches and pins, even messages written on arms & legs with a Sharpie. I should also mention that this event had 1,000 volunteers supporting it, and they were great--super positive and well-organized. The water stops ran like clockwork. They had people on mini-motorized vehicles cruising up and down the trail on the lookout for anybody who needed help. The marchers were urged to make sure to thank the volunteers, and we did; there was much gratitude in the air, a wonderful feeling. I'd never thought about the possibility of not finishing, but at mile 19, it felt like my body was starting to give me the middle finger. It was that shaky sensation, where you try to dig deep and realize there's nothing to dig into. That stop was possibly the longest we did, as I tried to drink more liquids and eat more Paydays and replenish my energy stores, while thinking, "Crap. I might actually not be able to pull this off." But once we got up and started walking again, that thought passed and I knew I would finish this no matter what. After all, I'd put in 19 miles, so how could I let 7.2 stand in my way? Still, we had to go through the (2 mile) sand trap area again, and that sucked. And then the final 2 or 3 miles were pretty tough. But it helped to do a little dialogue in my head, something like, "Oh, you want to stop? I bet the original Bataan marchers wanted to stop too. But they couldn't. And they didn't have any Gatorade. Now move it." Sue and I agreed that while this march was indeed rather painful, the fact that we were able to go out and do such a thing was purely awesome. That doesn't mean we weren't super stoked to see the finish line. Time elapsed: about ten hours and forty minutes. OK, how weird is it that something that was such a terrible ordeal, has given rise to something where you wear a timing chip on your shoe and see this sight at the end? After the finish, there was a scale where you could weigh your pack. Somehow, mine weighed in at 49 pounds (whut?! ), and that was when my 3L water bladder was mostly empty. Doh! I might have been carrying a few items I didn't need--but I also suspect that the "10 lb" bags of rice I bought, might actually have been more generous. Well, anyway, we weren't the only people limping around the El Paso airport the next morning. There are people who keep going back and doing this memorial march year after year. Most notably there is a survivor named Ben Skardon who this year, at the age of 97, walked 8.5 miles of the route--as he's done for the past eight years. He was one of 10 survivors who took part this year, and the only one who was walking. It's truly humbling to think about. I'm grateful to have had a chance to do something to honor Mr. Skardon, the other survivors, and all of those who sacrificed and suffered so much.